Micheline (Cardinal) Tremblay passed away on July 28, 2017. 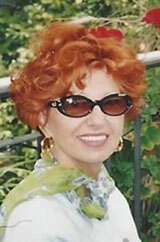 With her vibrant red hair and infectious smile, Micheline was a welcoming presence at The Neuro for over 25 years. She dedicated many volunteer hours to the patients and families of the Montreal Neurological Hospital. Her claim to fame – a mini-store program on wheels, and The Friends of The Neuro Boutique.